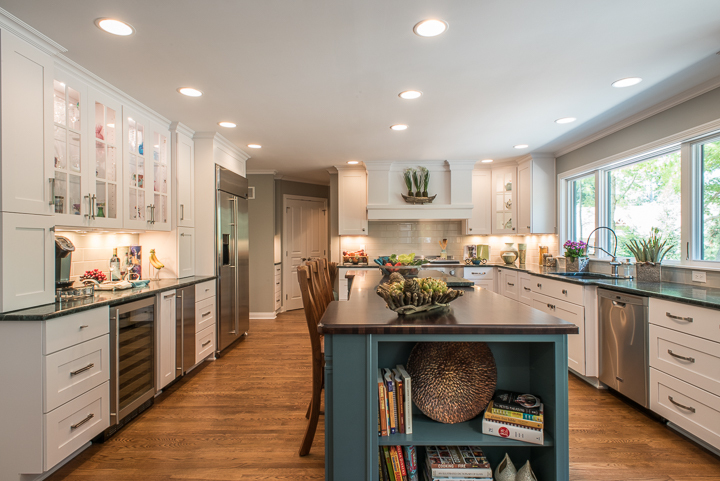 This project was particularly interesting as the clients documented the entire process of the whole home remodel and garage addition with regular Facebook posts. 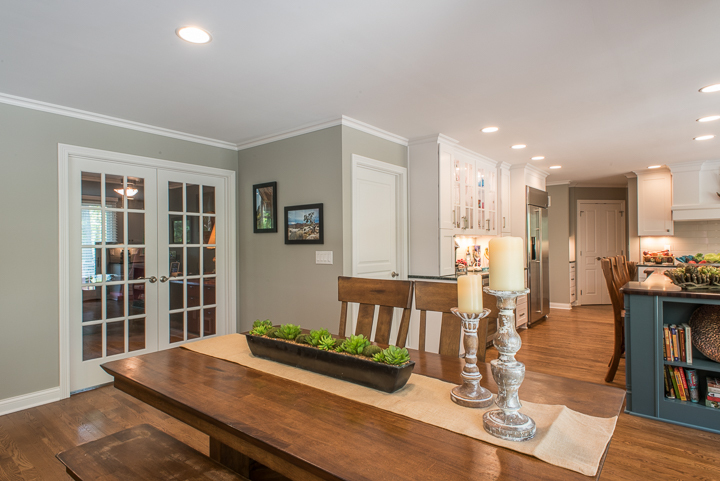 Their Facebook page not only provides before, during, and after photos and descriptions of events but also provides a client’s perspective on the experience of a large-scale renovation. Here, we will describe the work done and present finished photos. The transformation page of this project has several before, during, and after pictures of the project. For further information, please visit this homeowners’ Facebook page @TheRemodel. A primary goal for the homeowners was to create an aesthetically pleasing design to enhance and leverage the beautiful setting of the home. Another objective was to include aspects of universal design to accommodate aging in place. Outside of the home, we tore out the sidewalk, and poured a new driveway and sidewalks. The new sidewalk has no steps allowing easy access to the home. Like the sidewalks, the deck which leads out from the kitchen into the backyard has a ramp rather than steps to continue with the universal design. We poured a concrete patio at the rear walk-out area along with a concrete retaining wall. We repainted the home’s entire exterior including the brick and installed stone to achieve the home’s new look. The new limestone band installed on the bottom of the home along with the fiber cement shake provide stylish exterior accents. The new two car garage addition allows space previously allocated for the garage to be used for other purposes. We exploited this space by building a mudroom providing a place for hanging coats, putting shoes on and taking them off, and storage. 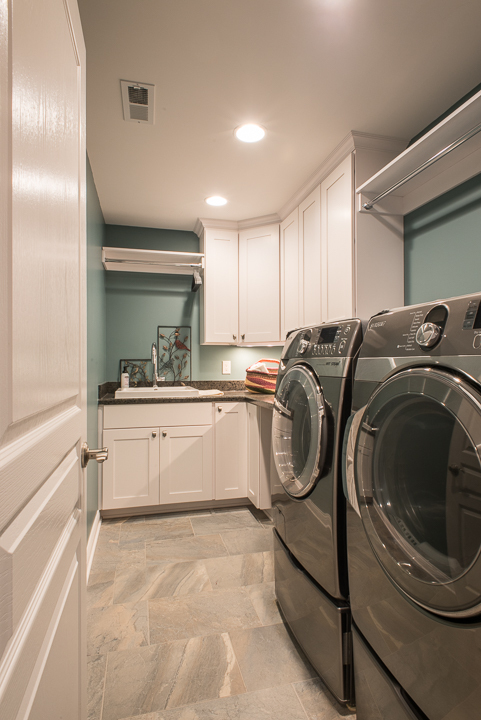 We also framed a wood floor over the concrete floor of the existing garage and created a new laundry room for the clients. Further on into the home, we remodeled the existing bathroom. 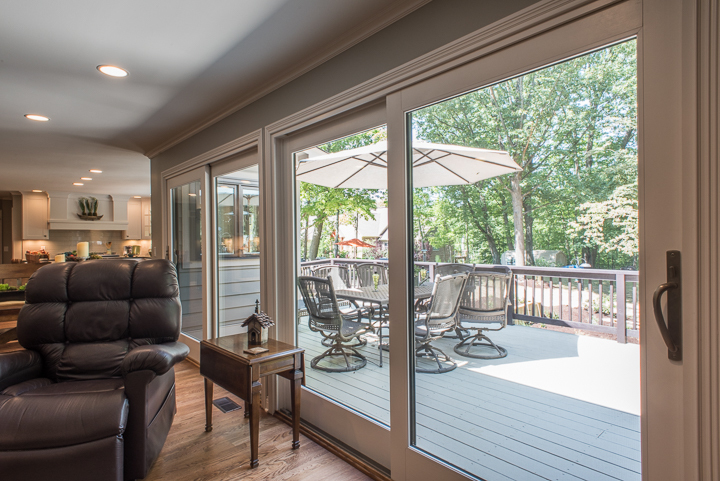 In the kitchen, the owners sought to create connectivity to their beautiful back yard through direct access to back deck and additional windows at the rear elevation. The owners also wanted abundant storage, a kitchen island, and a pantry. We removed walls to connect the kitchen and living spaces. We bumped out the back side of the home six feet in the kitchen to provide the additional space to accommodate an island. We installed new custom cabinetry, an island with a butcher block top, and a soap stone countertop along the perimeter. We added several beams to install the large glass doors in the living area which lead out onto the newly constructed deck. The result is a connected space which affords full view of the backyard and natural light for the entire space. To separate the office space from the living area, we installed two multi-paned glass doors. 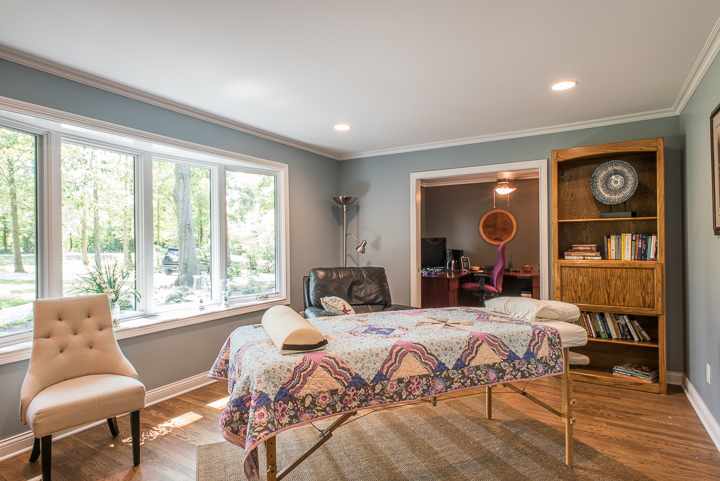 In the office we installed a new window and another set of pocket doors leading into the Reiki room which serves a relaxing and healing space. In the Reiki room, we installed a new bay window and crown mold. 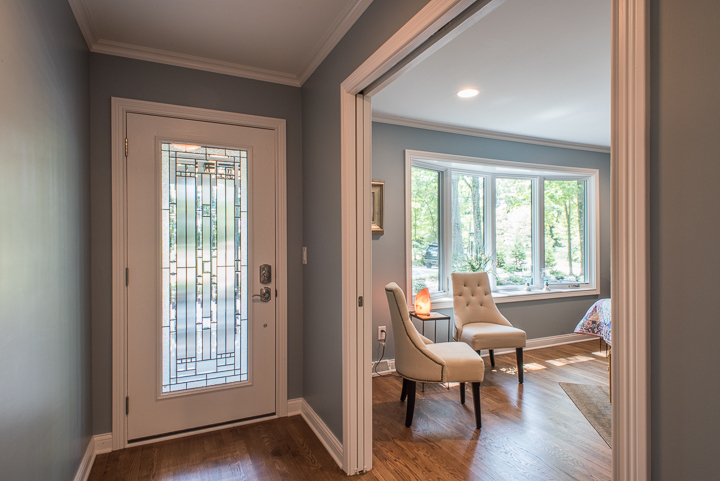 We installed another set of pocket doors on the other side of this room to close off the entryway from the room if needed. 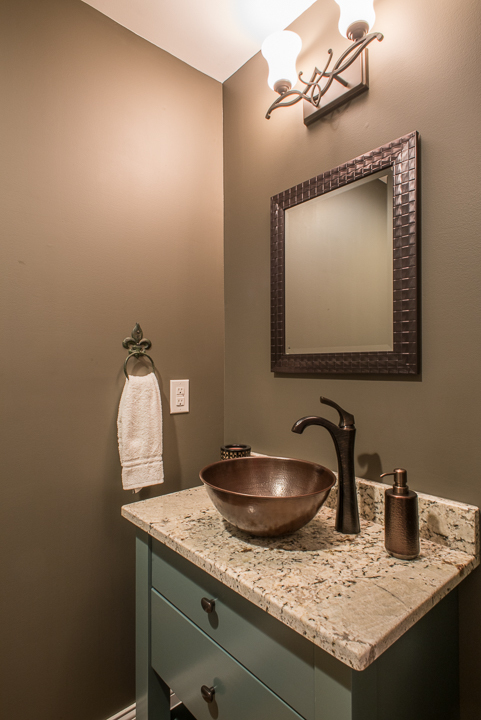 We completely gutted two existing bathrooms to the studs and updated both baths. Lastly, in the master bedroom, we tore out the brick wall and installed 8’ wide glass doors, sanded and finished the existing floor, and installed new closet shelving. The new glass doors in the bedroom exit to the deck as well and provide another excellent view of the clients’ backyard.